When I started depoting all of my powder products, the first thing I did was run to youtube for some good depoting tutorials. There are plenty of MAC tutorials, but at the time I did not find a single tutorial for Make Up Store eyeshadows! I didn’t give up though, and I discovered that the brand is in fact the easiest to depot that I have encountered to date! After figuring out how to depot them, I currently have all my MUS eyeshadows and blushes in Z-palettes. So, I thought that as I had a few MUS Microshadows and Cybershadows to depot, I could photography the steps so that others could too depot theirs. 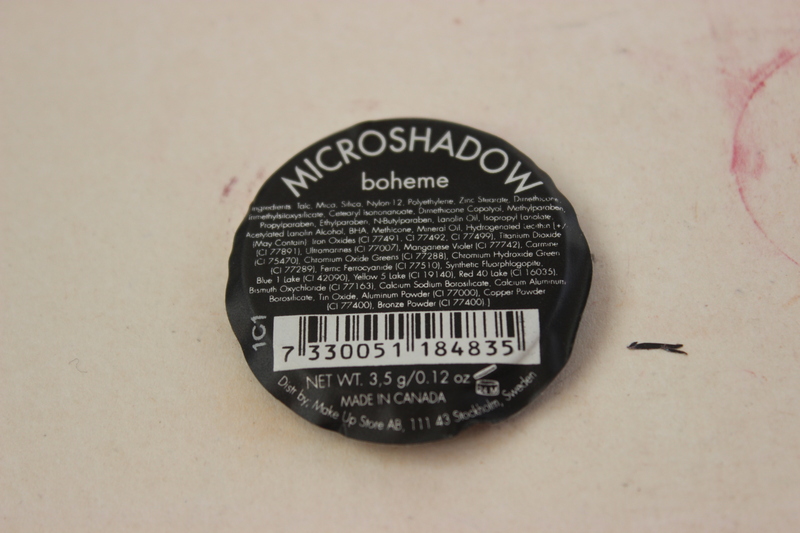 The eyeshadow featured is a Microshadow, but as Cybershadows have the same pots only smaller sized, the same method can be used with those. 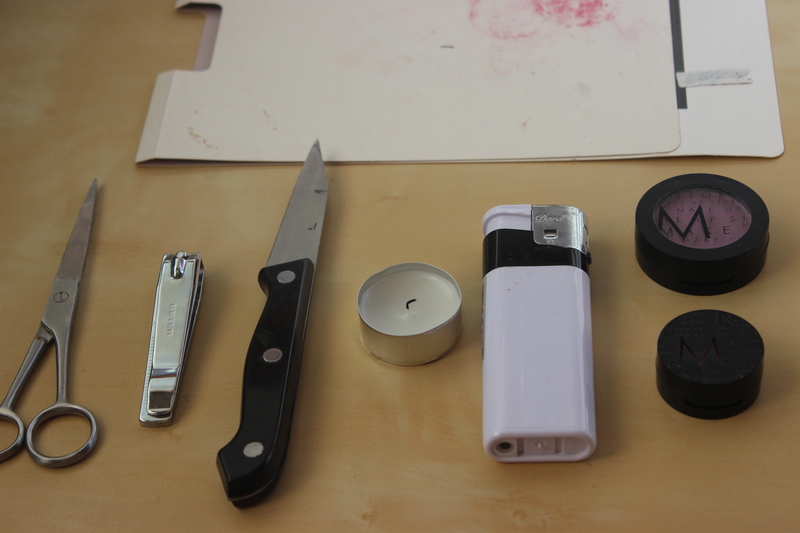 First of all, I prefer the heat method, specifically the tea candle method, so keep in mind that you are working with fire and a sharp object (knife) and that when melting the plastic can emit fumes. To summarize take all necessary precautions. Arrange the cardboard in front of you so you can use it as your work surface. 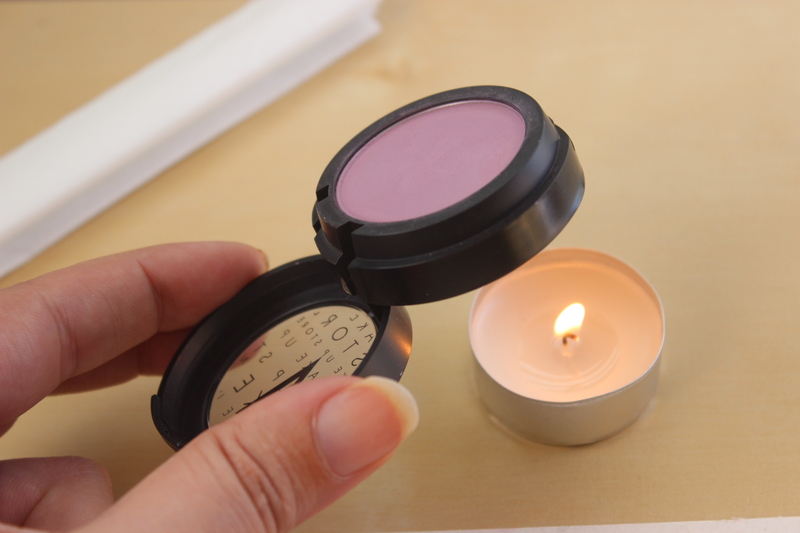 Light up the candle and position it at a comfortable distance. 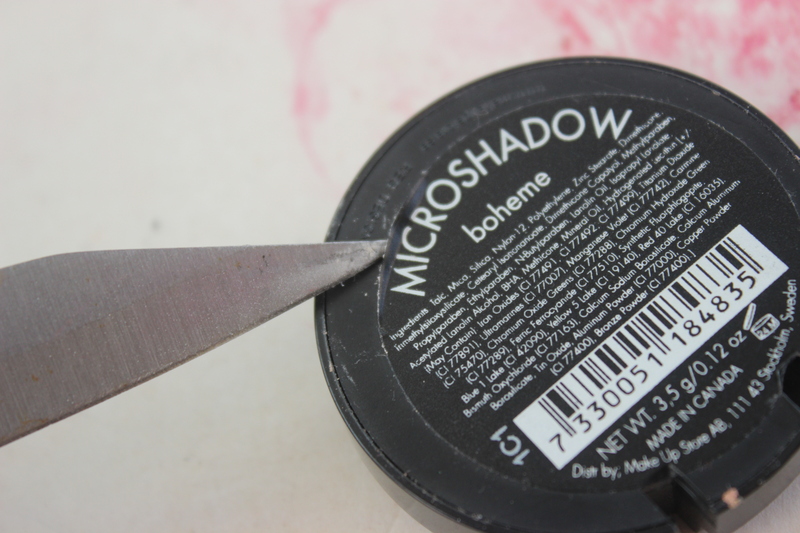 For some this is a very obvious step, but the first time I depoted an eyeshadow I did not know that you could reuse the labels! Simply put the pot close to the flame for a few seconds (not for too long or the label will burn). 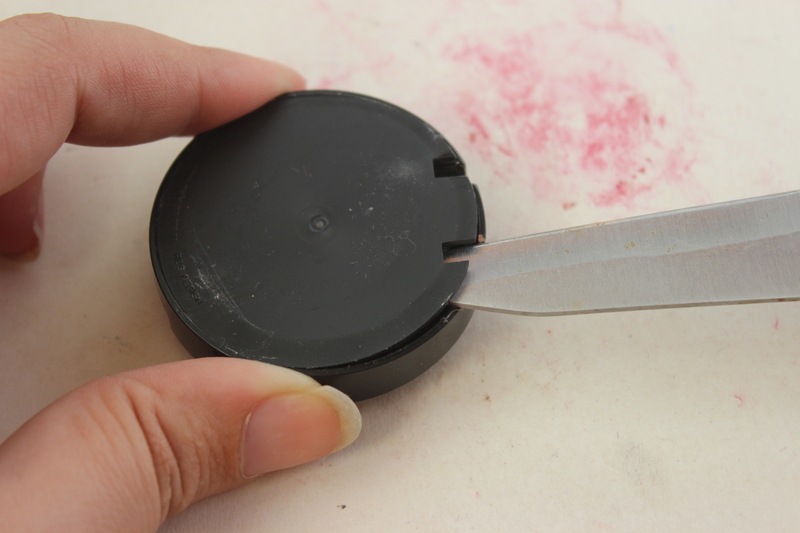 Next, use the knife to try to peel the edge of the label. If the label doesn’t give easily, put it back near the flame for a couple more seconds. As opposed to MAC, exposing the bottom of the plastic casing that surrounds the pan is very easy. 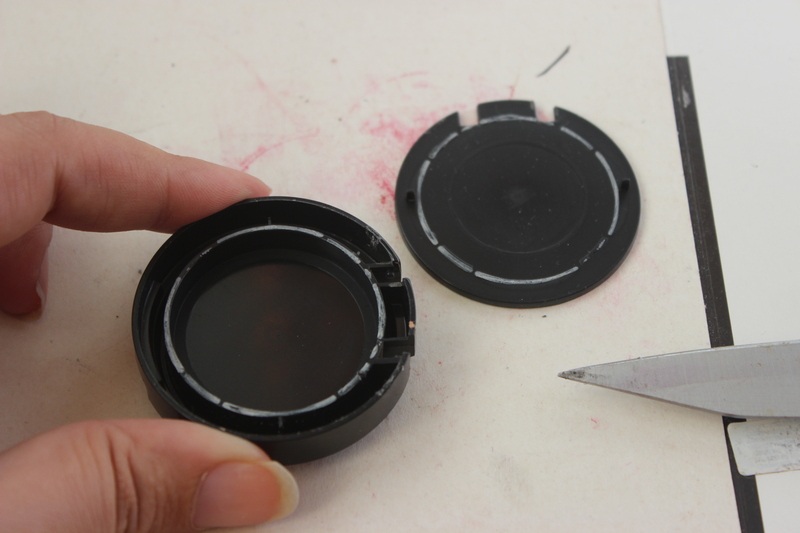 The plastic where the label is attached is glued to the casing, so simply insert your knife in the gap left between the casing and the plastic bottom. Then carefully jam your knife there and with some wiggle movement and some pressure it will pop. 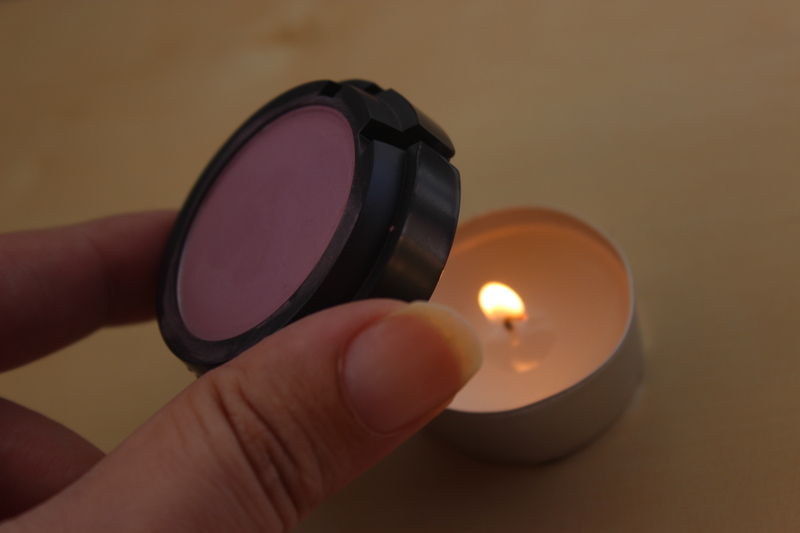 I like to hold the pot over the candle by grabbing the lid, they are handy that way! Also, I keep nearby a tissue folded several times lengthwise as it is very useful when you handle the hot pot. 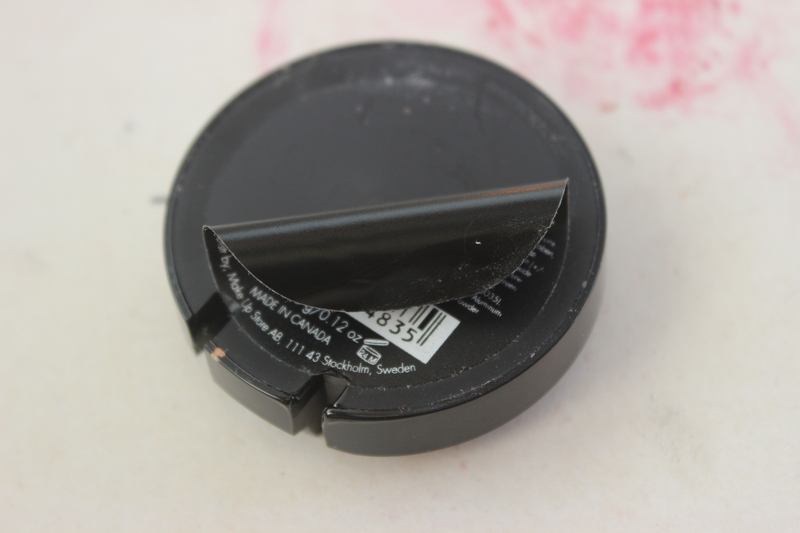 After 15 or 20 seconds, try pushing your eyeshadow pan out of the casing by pushing with your knife through the pliable plastic. If it does not give, hold it over the flame for a few more seconds. 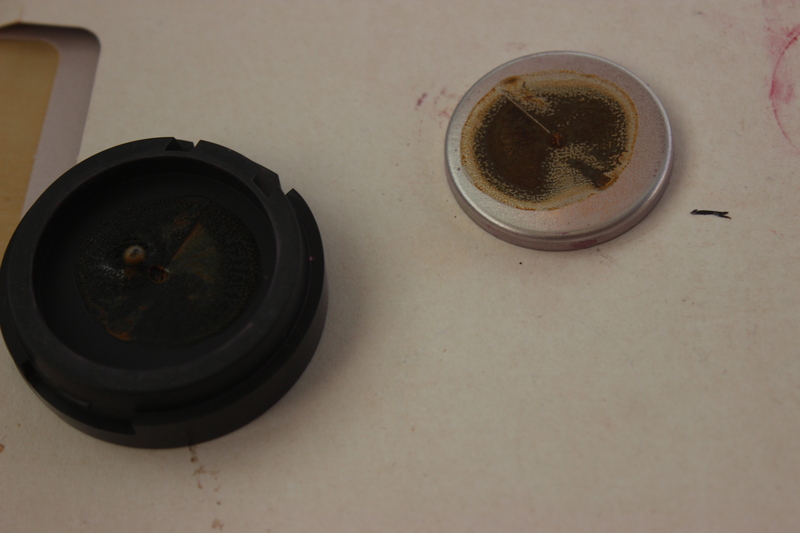 Be careful and do not put unnecessary pressure, least the eyeshadow goes flying all the way across the room (it has happened). 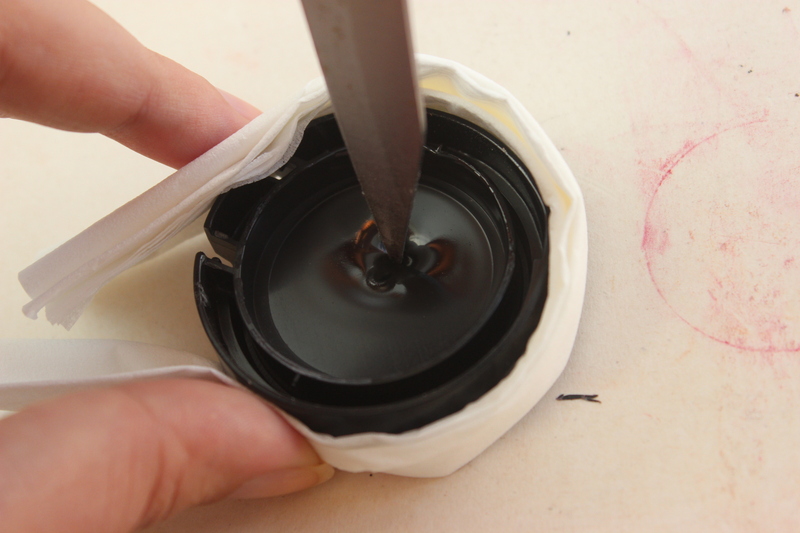 While the glue that attached the pan to the casing is still hot, attach the label back to the pan. Keep in mind that MUS labels are bigger than the pans (MAC labels are smaller than the pans though) so there will be excess to trim off. 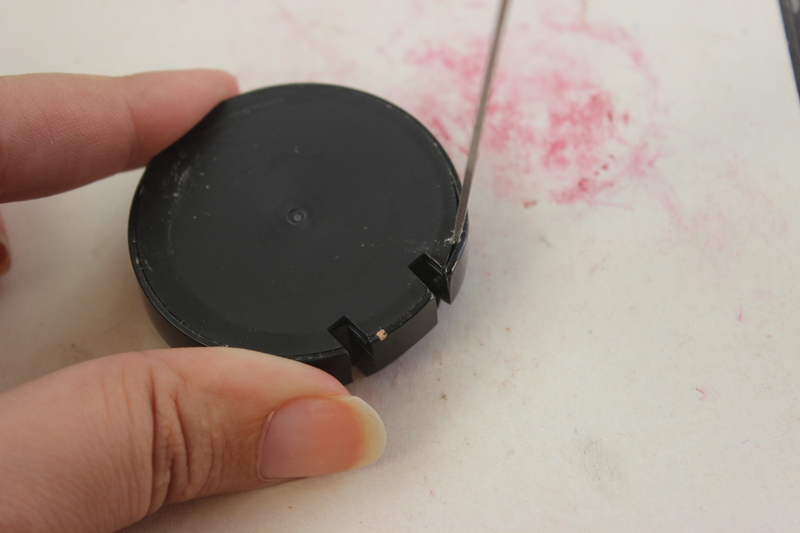 Be careful and attach the side with the name on it first so that the excess does not contain important information. 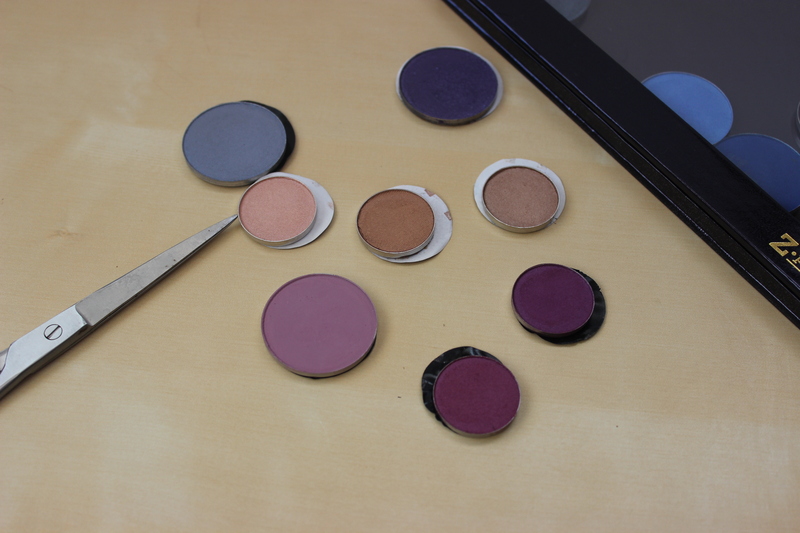 To depot these 8 eyeshadows it took me around 35 minutes, so it is quite a quick procedure that will allow you to organise your make up as you wish. 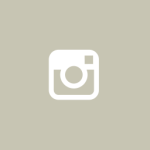 Once you have all your eyeshadows depoted, it is time to find them a place in your palette! Great tutorial! I should do this more often, but I am always scared I’d ruin the eyeshadow or something. At first, and after hearing so many horror stories, I too was scared. I’ve found that the only trick is being really patient and not rushing it, to allow the plastic to really melt so that the pan pops out easily. 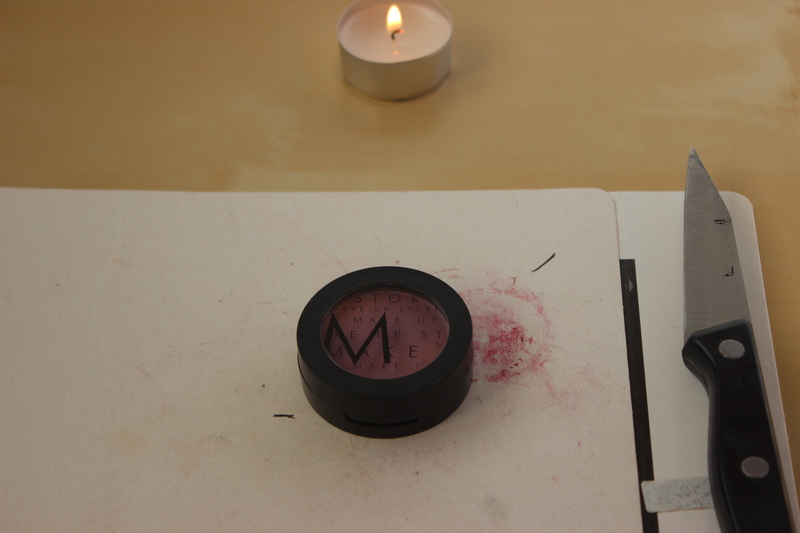 However, as I mention in the post, the MUS blushes and eyeshadows have to be one of the easiest to depot! Thankyou for such an easy tutorial! I’ve been wanting to do this for ages but never had the confidence! I find it much more practical to have my powder products in palettes. I am considering depoting my naked palette as well since I never use it! Good idea! I find I have too many palettes I never use because I can’t actually see all the colours in front of me. I’ll have to do a post with all my depoted palettes!! Beautifully done and explained. 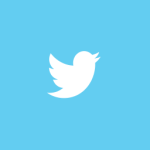 Personally, I prefer blog posts over videos, because they seem to get to the point quicker. 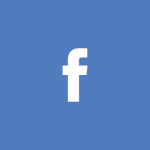 As an added bonus, you can bookmark the post and review the information to your heart’s content.